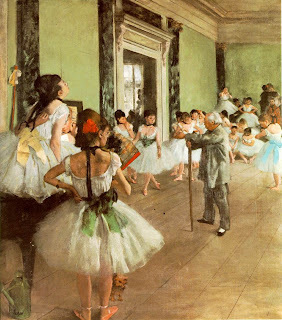 ART 223: Modern and Contemporary Art HIstory: "Dance Class at the Opera"
Dance Class at the Opera was painted by Edgar Degas in 1872. This is just one of many Degas' paintings that involve ballerinas or the art of ballet. In this painting you see various young ballerinas being instructed by the ballet master. As my eyes surveyed the scene i noticed quickly that most of the girls in the painting arent paying attention to the ballet master. Most of them are stretching their necks in pain, adjusting their costumes, or sitting trying to get a minutes rest. This highlights the fact that ballet is strenuous and often considered a form of labor, not to mention Degas' love for capturing the look of labor in a situation. The girl with the light blue bow on her outfit brought my attention to the right side of the painting. Over here i noticed what looks like a couple parents sitting in on the ballet lesson. a couple of the ballerinas look like they are getting comforted by their parents or they are just helping them adjust their costumes appropriately. From there my eyes slid across the painting to the girl standing right in the immediate foreground. She seems to be one of the few girls who is giving the ballet master undivided attention. She also looks like she is fanning her self, this also highlights the fact that they are performing a laborous task. To her left there is a girl sitting on the piano who looks aggravated about her uniform. Her facial expression says it all while she stretchs for an elusive itch. Upon first glimpse this is painting looks like any ordinary ballet practice, but given a second glance; this painting by Degas' really shows the attitude of the ballet scene in Paris. I have always loved Degas. I danced ballet for about 15 years growing up and was always blown away by his paintings. Only now do I see the history behind many of them, but none the less, his depiction of the ballet and dancers still amazes me.